BANGOR — The UMA Bangor Campus community came together early this month to honor their 2018 graduates at a Graduate & Awards Banquet at the Spectacular Events Center in Bangor. Many awards were presented during the evening’s festivities. Among those honored were Ahmad Jawad, recipient of the Dental Hygiene B.S. Academic Program Student of the Year award. Criteria for Academic Program Students of the Year include academic scholarship, service, governance, overcoming personal hardships, and contribution to campus life. The Outstanding Justice Studies Student Award was given to Hayley Mae Doyen. The award recognizes outstanding academic performance in Justice Studies courses. 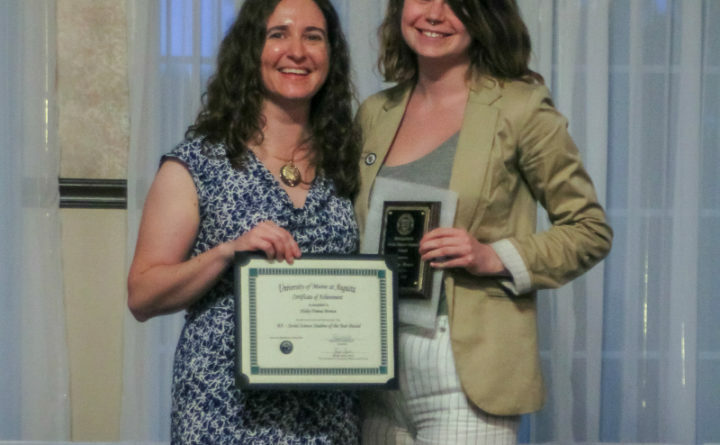 Haley Brown, was the recipient of several awards, including the UMA Bangor Campus Outstanding Student of the Year, Social Science BA Student of the Year, the Outstanding Honors Program Student Award, and the WICCD Award. Brown was also honored as an SGA Student Representative, and is pictured with Kati Corlew, Assistant Professor of Psychology. Brown has worked at Nottage Library at the UMA Bangor Campus for the past three years, where she has been instrumental in developing the Nottage Library cafe space, supervising and training student workers, managing the library’s finances, and representing the library in numerous campus-wide initiatives and committees.